Las Vegas, NV – is welcoming the 2013 Amazing Las Vegas Comic Con (www.AmazingLasVegasComicCom.com ) to be held on June 14-16, 2013 at the South Point Hotel & Casino. Confirmed guests include Jim Lee (Batman HUSH, Superman, Justice League, The X-Men); Stan Lee (Creator/Marvel Comics Legend); Greg Capullo (Batman); Rick Remender (Captain America, Uncanny Avengers, Uncanny X-Force); Humberto Ramos/Ryan Stegman (Spider-man); Skottie Young (Marvel Now); Gerry Duggan (Deadpool); Jessica Nigri (Cosplay Superstar); Mat Nastos (Phineas & Ferb); Tony Fleecs (My Little Pony) as well as some of the most popular artists to be held on Artist Alley. For a full listing please visit the website. Stan Lee is coming to Vegas! Stan is 90 years young and the creator of what is largely known as the Marvel Universe! Somehow, everyone is a FAN! Whether it’s Iron Man, The Avengers, X-Men, Spider-Man or one of the many others, everyone knows and likely loves the Marvel brand! 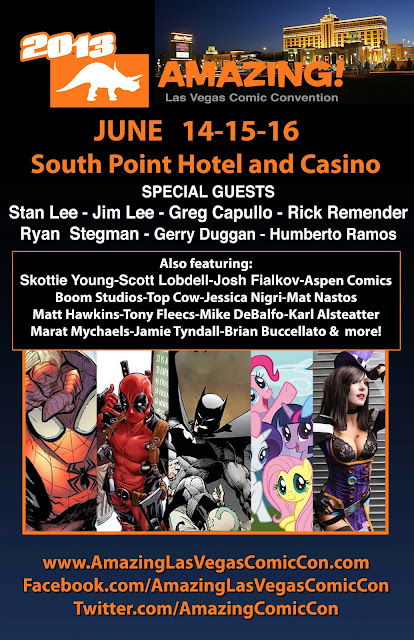 Jim Lee is also coming to Vegas! Jim is an industry legend and known as the best comic book artist of all time! His launch of the X-Men franchise sold the most of ANY single comic book. Jim has moved on since with Best Selling runs of Batman, Superman and Justice League at rival DC Comics, which he runs for Warner Bros.